Here’s how democracy really should work. Like America, Taiwan has a representative legislature and not direct democracy. This means that we choose representatives to beat the crap out of each other so that we don’t have to do it ourselves. The video of today’s incident, however, doesn’t show any of that (maybe some wrestling), but it does show other favorite strategies such as climbing onto the speaker’s podium, throwing water and paper at each other, and the time-tested strategy of punching an opposing representative in the face. At the beginning of the clip, note the clerks trying to pry legislators’ fingers off the podium. Not a bad way to end a filibuster. 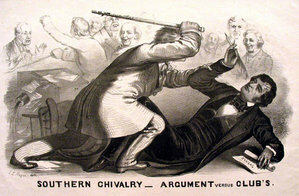 So far, our relatively more mature democracy has had only one caning, and that was during the run-up to the Civil War when tensions were high. Whether or not you support these more direct negotiation tactics, I assume, depends on who has the majority in Congress at any given time.